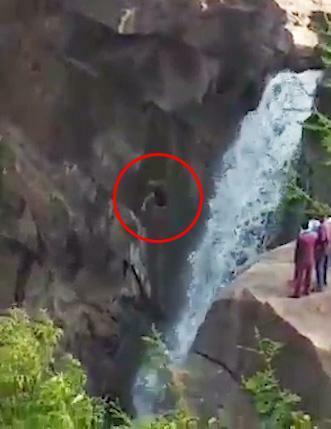 This is the horrifying moment a man fell to his death after his pals convinced him to climb down a cliff face for a selfie at an Indian waterfall. Twenty-something Ramjan Kagji lost his grip while clambering down a steep set of rocks, in the Indian state of Karnataka, and plunged 170ft to the water below. He risked his life to get the famous Gokak waterfall, a popular local attraction, into his photo, according to the Times of India. Mobile phone footage captured the moment bystanders began screaming as Kagji, who is reported to have been drinking, began falling. One of the men can be heard in the background saying: "He is gone." Another fellow tourist said: "We spotted him going near the edge. We warned him not to but he wouldn't listen. The waterfall is infamous for being one of the region's most dangerous selfie spots, with several reported deaths there. It is also understood to be a notorious site for locals who wish to commit suicide. The regional administration has apparently been unsuccessful in taking measures to secure the place with a proper fencing. The police arrived there shortly after the man died and have opened an investigation into it. Cops are still trying to identify the dead man and confirm if he lived locally. In a similar accident last year, two drunk Indian youths jumped off a cliff while trying to show off for the camera.